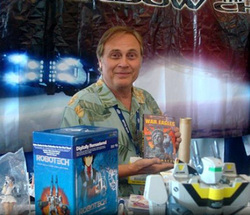 Carl Macek was best known for producing Robotech, the redubbed and edited adaptation of three different anime series -- Macross, Southern Cross, and Mospeada. He also worked on the dubbing of many anime projects from Captain Harlock and the Queen of a Thousand Years (redubbed and edited adaptation of Captain Harlock and Queen Millennia) to more recently, Bleach and Naruto. He passed away on April 17, 2010.